A large collection of GCF worksheets is meticulously drafted for students in grades 6 through 8. GCF is also known as 'greatest common divisor'(GCD), 'highest common factor'(HCF), 'greatest common measure'(GCM) or 'highest common divisor'(HCD). 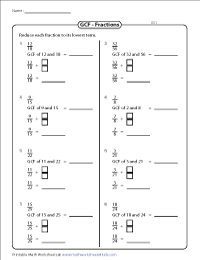 Download and print these GCF worksheets to find the GCF of two numbers, three numbers and more. Employ our Venn diagram worksheets for better understanding of GCF. List the factors for each pair of numbers. Then, compare to determine the GCF of the two numbers. Worksheets are categorized into three levels based on the range of numbers. Use the prime factorization method to find the GCF for each pair of numbers. 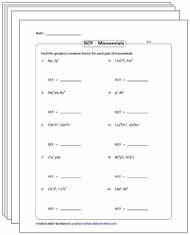 This batch of multi-level worksheets contain a total of 150 problems. Use the answer key to validate your solutions. Write down the factors for each pair of numbers in the Venn diagram. Then, list out the common factors in the intersection. The largest factor listed in the overlapping region is the GCF. 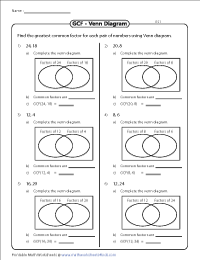 Find the GCF for the numerator and the denominator of the given fraction in this set of worksheets. Then, reduce the fraction to its lowest term by dividing the numerator and denominator by the GCF. In this batch of worksheets, determine the GCF for the set of three numbers. Apply prime factorization method to list out the common factors. Multiply the common factors to obtain the GCF of the three numbers. Gain an in-depth knowledge in finding the Greatest Common Factor of polynomials with these worksheets available in easy and moderate levels, find the GCF of two or three monomials, GCF of polynomials, find the GCF using the division method and more!